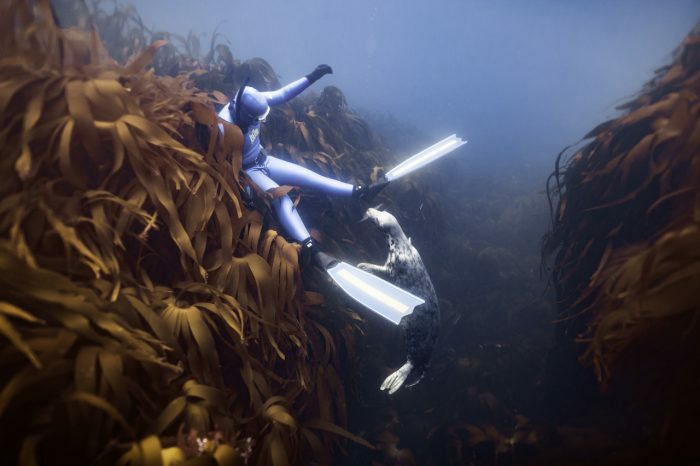 National Champion freediver Georgina Miller tells us about the beauty of diving in Cornwall and how you can experience it for yourself. I’m remembering a day out last summer with really good friends. We jumped off the back of the boat into absolute crystal clear, blue water. It could have been the tropics (aside from the temperature!). We were close to one of Cornwall’s most picturesque beaches, on the seaward side of an island of rock, sticking close to the high cliffs, we had a beautiful calm day. Black, pink and green whorls of colour from the serpentine rocks rose above us and below to a carpet of perfect white sand. The rock walls became more fractured and soon opened up into deep gullies and the entrance of caves appeared from the deeper parts. Shoals of whitebait were hanging around the entrances making it difficult to see the shape of the caves behind. We freedived down into them, exploring, coming across a friendly seal, and some weirdly shaped rocks that I later found out were cannons, possibly from a Dutch shipwreck in the 1700s, according to the coins and buckles that have been discovered there before. 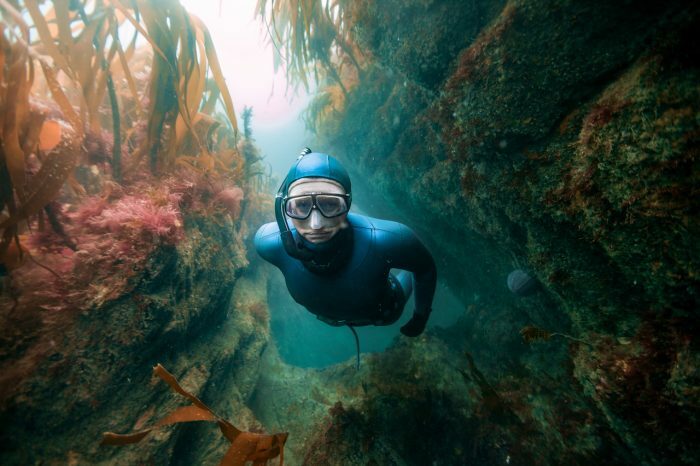 I think we must have forgotten about the cold as we spent around two hours swimming along through the gullies, around the beds of kelp and shy fish, feeling amazed at the marine architecture. We were then picked up by our amazing skipper Mike, who I’m sure has eyes in the back of his head. 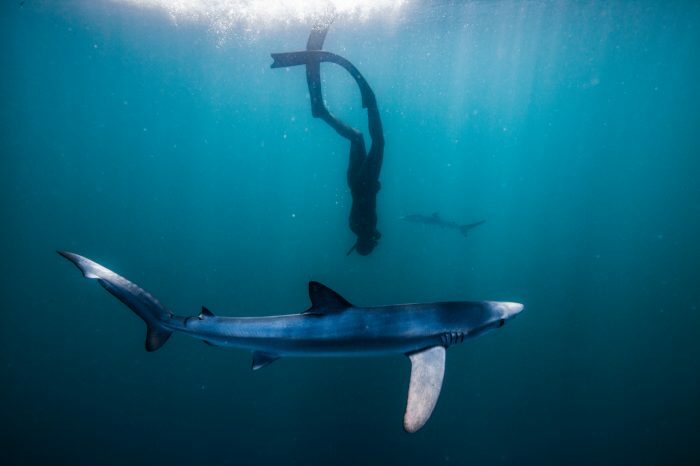 He is able to spot a bunch of freedivers in blue or black hoods while keeping an eye on the horizon for dolphins, basking shark or a myriad of other wildlife that he knows we would love to see. Retiring into a very comfortable boat for a bit of lunch, a hot cup of tea and off to a different site for more exploring. 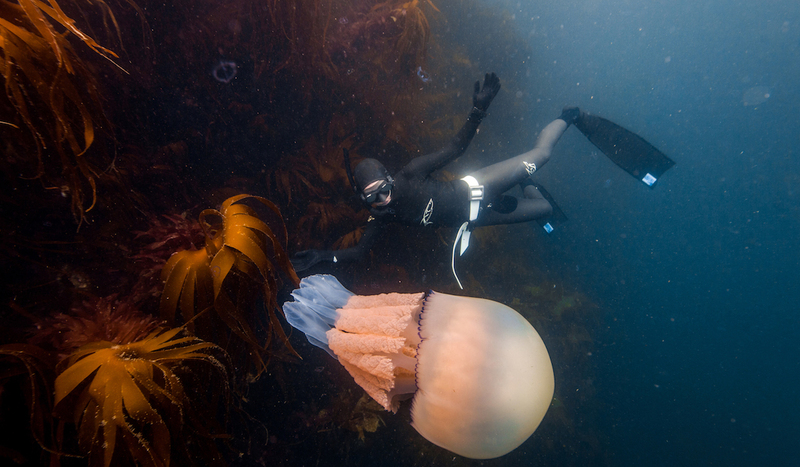 This is one of the many reasons I love free diving in Cornwall. 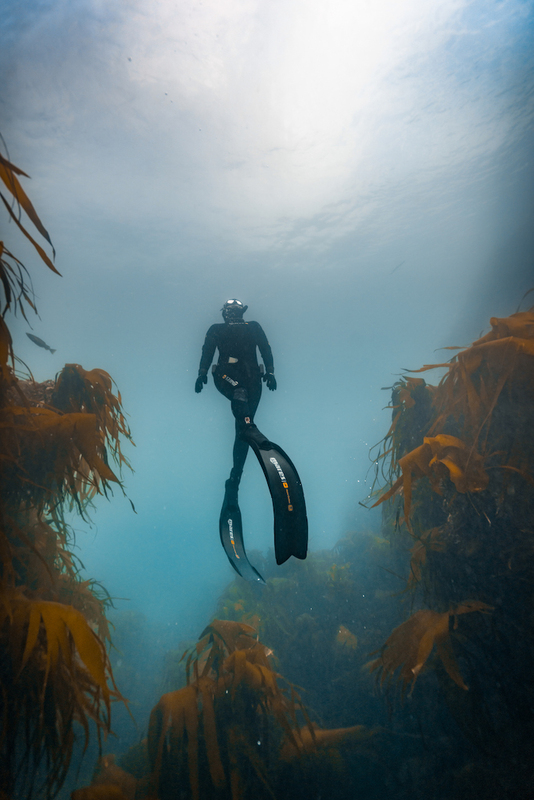 When you imagine freediving, it conjures associations of warm clear blue water, not something that you would associate with the UK, but Cornish waters have a surprise. Freediving is the sport of diving underwater on a single breath. 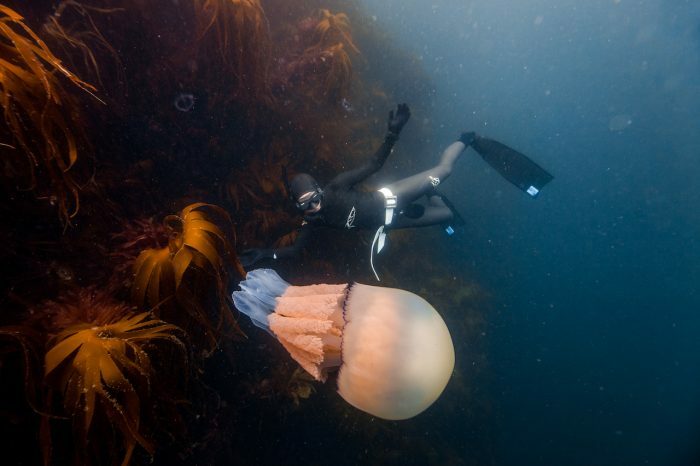 It’s not just about competitive diving, where you hold your breath for as long as you can or see how deep that you can swim, although that is certainly a big draw, it is also a lovely way to explore the underwater world and interact with wildlife. This is all such a far call from our life in London. Daan and I moved to Cornwall 4 years ago to set up our freedive school. For Daan (a world-class, freediving photographer) it made complete sense to live by the sea. We moved to make sure that we were doing more of what we love and less of what we didn’t. Both being self-employed before the move made us quite adaptable to making the big change. Work for us has always been about having reasonable transport connections and good internet. 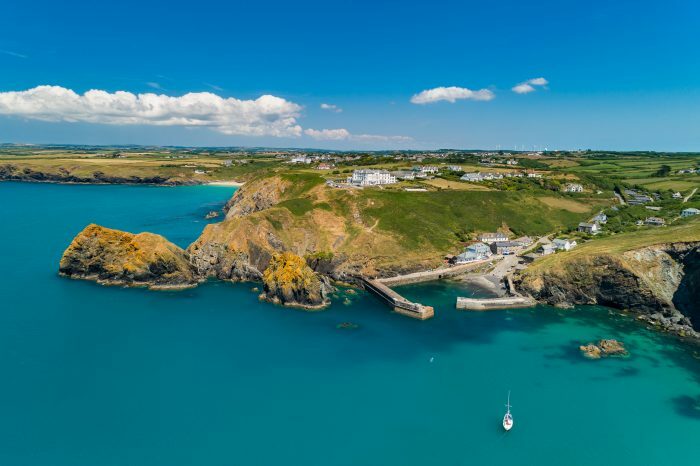 I think that perhaps we have faster internet in the little hamlet that we live in now than to the big smoke, and actually have found it is possible to get up to London and back in a day for meetings by flying from Newquay. Cornwall has offered us the perfect environment to set up a fledgeling business and an amazing work-life balance. 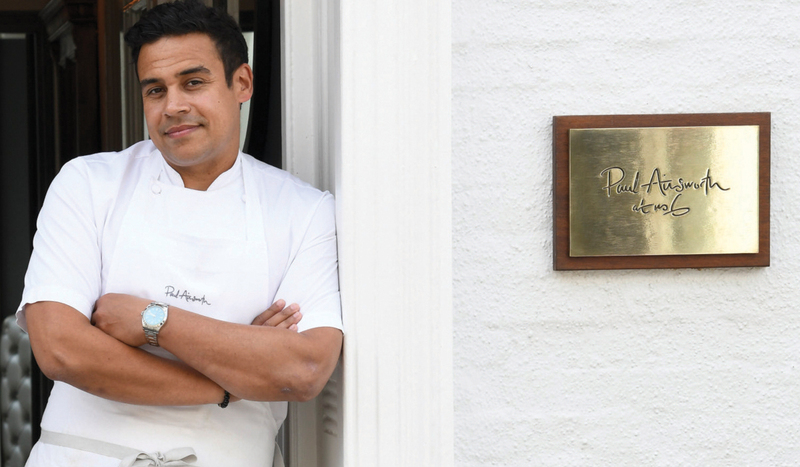 We have found the people just amazing and supportive and actually, there are so many working in the way that we do with small businesses built with real love – we have made wonderful connections. Taking a freedive course with a qualified instructor is really important. It is a very safe sport when people are properly trained and always diving with a buddy. In my opinion, learning to freedive in the environment that you will later be exploring is really important. Not only do you learn the techniques and science behind freediving, but how to plan a dive properly, taking in environmental factors, we train ourselves to dive safely, without incident, and how to rescue in the unlikely event that you need it. Freediving has its roots in yoga, meditation and breathing techniques. It goes way beyond a duck dive and snorkel. Many freedivers would argue that it is a good life skill, learning to face your fears, control your breath, still your mind, calm your heart, relax and focus. All humans share something in common with our aquatic friends the dolphins and seals: the Mammalian dive reflex. When your face comes into contact with water, your heart rate will slow, and this conserves valuable oxygen for when you hold your breath. Your blood will also move into your core, protecting your lungs and vital organs. Your body already knows how to hold its breath. People have been freediving for millennia, looking for food and exploration, it is a really natural thing to do. Many freedivers find that yoga and meditation will help with their underwater practice. We learn proper breathing techniques and hydro-dynamism, freedom of movement underwater with efficient movement, again to conserve oxygen and make the dive last longer. This is one of the reasons that freediving appeals to so many, you are unhindered by heavy equipment and truly free to explore. So why learn to dive in Cornwall? 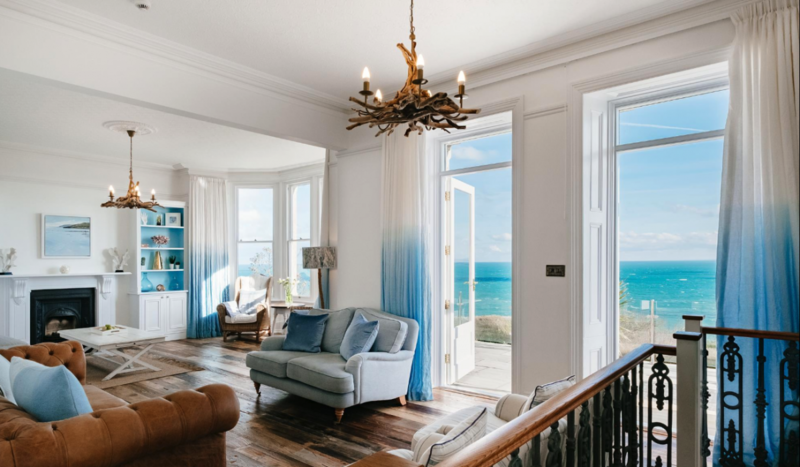 As a peninsula, we have miles and miles of coastline to explore, with so many different environments, wonderful long beaches, rocky shores and shipwrecks. We are lucky here at Porthkerris to be sheltered on the most part from the prevailing westerly winds, on the edge of a marine conservation zone- the famous Manacles. Catching the gulf stream, the water here is more temperate. For this reason, it attracts a huge amount of marine life. The reef is so pretty, really colourful and bright, it will surprise many with its almost tropical bright colours. The shipwrecks are world famous, although often fairly broken up by the wild winter storms. We are very lucky to have many resident and visiting whales and dolphins, seeing them breach and swim past the dive boat is always breathtaking. Cornwall is also home to the Atlantic grey seal, who can sometimes be very curious and approach to nibble a fin. Freedivers make no sound as they explore underwater, so it means that you can get really close to wildlife. 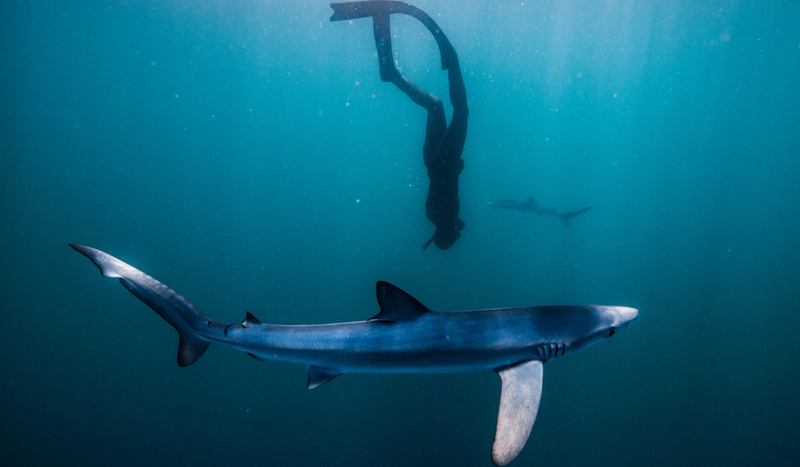 Another fascinating visitor to these waters are the beautiful blue shark, the very best way to get close to them is freediving. We also have access to deep water by boat for the more experienced freedivers who want to go a bit deeper. The depth diving here is in many ways easier than the cold lakes of the UK as the thermoclines are less pronounced and it is a lot less dark. Although, we do have more water movement, making the windows to go deep freediving with a line a bit smaller. On a good day, it can be world class. I think there is a little something for everyone here, learning to freedive in Cornwall can provide a lovely sheltered environment for beginners to hone techniques, learn to plan dives and watch for good conditions. The wildlife is spectacular, the historic wreck dives fascinating and the deep diving challengingly brilliant. I think something that really appeals to me is that all of this is a very real habitat. Nothing here is fabricated or manufactured for diver training- it is alive, visceral and mercurial in its changes. 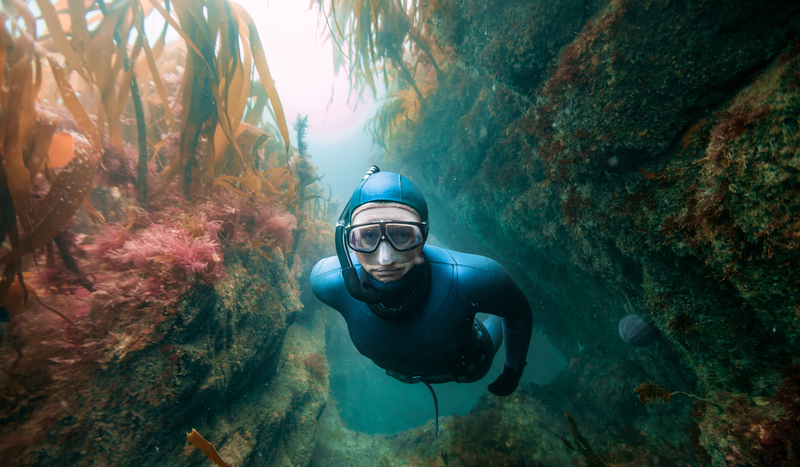 Learning to freedive here in the sea will really give you an understanding of why our oceans are so vital, for both the planet and as food for your soul. I have met some of my closest friends through freediving – it is a fantastic community to be a part of. 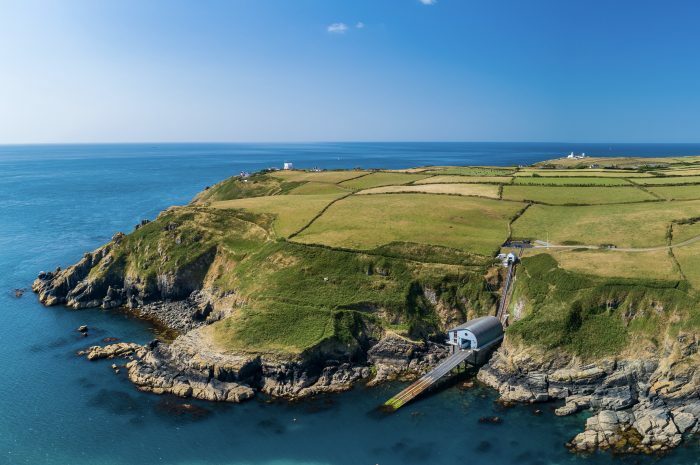 Aquacity Freedive is located at Porthkerris dive centre which has 5-star facilities. There are on-site classrooms, pool and the diving is right off the beach. Coming out to a hot shower and a warm cup of tea at the cafe will seal the deal! They stock a good range of MARES equipment and provide you with the latest cold water specific gear for your course. They also teach SSI, PADI and AIDA courses from beginner to instructor level. 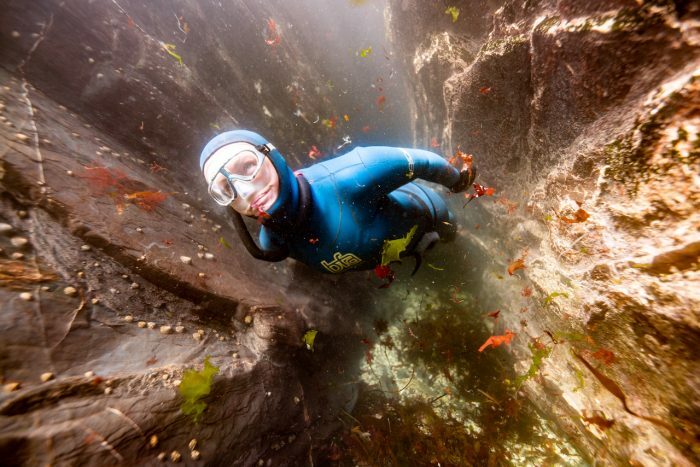 Georgina Miller is a 6-time national record holder and part of the UK Freedive Team since 2007. She won the British Freedive Association UK National Champion Award in 2017. Daan Verhoeven is an 8 time Dutch Freedive record holder and one of the most accomplished freedive photographers in the world. Underwater photography all courtesy of Daan Verhoeven.